​If the winter season in Yosemite is bringing snow, it's also bringing rain to the lower elevations, so with that comes "Muddy Water Fly Fishing". We've broken down a few tips and trick for catching trout during winter runoff and any other time you might find yourself fly fishing dirty, muddy and dark water. One of the first things I make sure I do when I set up my rig for muddy water is to keep the light leaders and tippet at the shop. If you know the water is going to be dirty and muddy, I promise you will not be needing the 5x or 6x. I like to use anything from 1x to 3x during these types of fishing conditions because I know that the fishes visibility is cut by 66%, so having a small tippet is the last of my worries. Once I got my rig ready, I want to make sure to find the right holding water for trout during high, muddy water flow. During these times, trout want to stay tucked in the slow sections, so look for turing banks, side boulders and trees, pocket behind big boulders and anywhere near the bottom of the river where they can hold in the slower current. Now the hard part is presenting a quality fly to these locations and even when you do, chances are you will have to cast a few extra times to give them a chance to see your fly in the muddy water. Lastly, once you've set up your rig for big fish and you've found holding water, you need to get your fly to the trout and make sure it has a chance to eat it. I like to fish "Large and in Charge" flies in muddy water. Something like a stone flies, turd flies, tungsten beaded squirmy wormies and wooly buggers. I try to cover both color angles, so I my set up is usually a black turd fly(size 10) with a pink squirmy wormy. This duo tends to land me the most trout in muddy water. Now the the rain has let up and your done reading this quick fly fishing tip, grab your rod and go chase yourself some large trout in the "not so scary" muddy water. Could this be an amazing and rare trout to catch in Yosemite National Park? At first glance, one might think this is just a typical Rainbow trout. Yet, unique traits stick out when closer observation is paid. Look closely at the fins, they have spots from the base of them to the tips in some areas and the gills carry a strong reddish tint, both of these characteristics are from the Cutthroat Trout. The sides of this beautiful trout hold definite larger "Golden Trout" spots and strong and bold small black spots. This has all the characteristics of a rare example of a Yosemite Golden Cutthroat Trout. A lot of anglers live or fly fish in places that only allow seasonal fishing opportunities. Yosemite National Park is my home fly fishing water and it's rivers are closed to any style of fishing until the last week in April. 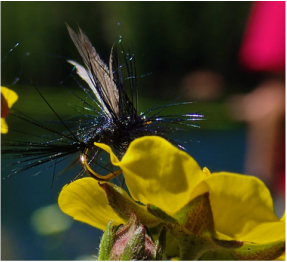 There is no reason why this part of the season has to be considered down time, even if you can't travel to fly fish those bodies of water that are open to accommodating your fly. I like to use this time of the year to re-organize my fly boxes and to re-tie flies that I depleted over the past fly fishing season. For example, last year produced a great stonefly hatch in the Yosemite area and I ran out of almost all my size 10-16 stoneflies. Needless to say, they are at the top of the list this winter, plus many more, including my newly created "Yosemite Stonefly". The fact is, a well organized and prepared angler will be able to spend a lot more quality time on the water in the summer time, therefore catching a lot more trout.